Edited to add: what makes you think that the ITTF cares about defensive play? Has any of their actions since and including the introduction of inverted rubber made defensive play any better? I do not think that the ITTF cares about defensive play. A lot of rules have been specifically designed to curb defensive play. However I did not have the impression that the ITTF wanted to eliminate classic chopping defense for good. It is somewhat ironic that one of the few rule changes that were not designed to be anti-defense is now going to accomplish the eradication of defensive play. However, I do think that the ITTF cares about the attractiveness of the game, and the new ABS balls lead to the winning strategy being "stand as close to the table as possible and kill-smash every ball". Right now, players are only beginning to adapt to that strategy, but once we see players that have been trained from the beginning to do that, we will hardly see any play beyond the third ball. I don't actually think this is the way the ITTF wants the game to develop. Are there any plans to do something to rescue defensive play (like, e.g. ... introduce a new ball specification regarding minimum spin)...? I can only answer to this part, but with Yes. The friction between several balls and tables is currently investigated, and based on the data it will be decided whether a limit for friction can be introduced. We have seen the first results about this during the World Championships in Düsseldorf, but it is still ongoing research. The goal is to narrow the variation between the ball types a bit further, if still necessary, which will also mean that non-celluloid comes still closer to celluloid. May I add that I think that friction is not the only, possibly not even the decisive factor, for the spin reception of a ball. It seems to me that the hardness of the ball is also quite important. That would explain why the non-durable first-generation plastic balls were more receptive to spin than the harder new ABS balls (and also the receptiveness of the softer celluloid). So (in case you are not already doing so) I would suggest that you include ball hardness in your investigation. Yeah I think if we could get a slightly softer ball we would be much closer to celluloid, but then again that just makes serving problematic again for viewers. There has been some confusion about DHS D40+ balls between those dated XGAG (July 2017) and earlier. Has DHS varied its apporoval of the D40+ balls this year? According to some reports the XGAG version have a distinctly different seam structure to those dated XGAB. There is also some conjecture that DHS may be rebadging old stock of their 40+ balls as D40+, or that some other organization is doing so, or that they are fakes from some other source. No, there was no change in the approval of the DHS D40+ (otherwise it should again get a new name). Also, a substantial change in material by a manufacturer without notice to ITTF is unlikely, because the risk of this being detected during the random testing is high and may result in serious consequences. DHS has fully supported from the beginning that the new ball gets a new approval and a new name. And at least in Germany I see stocks of "the old" DHS 40+ balls being sold completely official, in the expected and legal way, without any member of the supply chain deceiving anybody. I recognize in the postings, however, that people see the variations beyond a natural extent coming for example from the use of different batches of raw material. I cannot speculate about this. But should the lab data from all the OEM and clones we are currently buying show something unusual, we will of course take it up. As checking some new balls through the ITTF approval list I cant see stamp image, thus it is now impossible for people to distinguish a fake product. No reference image included into the approval list. So bad. 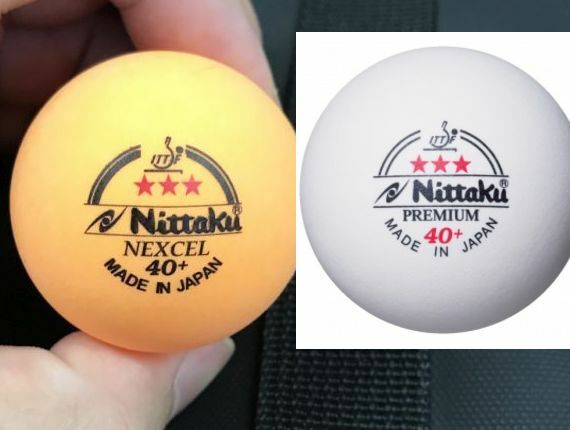 As an example, could you please give me an image of standard stamp for this Nittaku NEXCEL ball. It is now available from an Asian marketplace (other than Japan's), and it looks very, very suspicious to me. Sorry for being late, since at the moment I do not regularly visit the forum, in the absence of frequent questions. However, finally, please see picture attached, which comes from my records of the approval process, done by our office, but with me normally copied. On a first glance, I cannot see a difference to the stamp you posted, so this would be good news. Do you know why the ITTF no longer has graphics of balls (or rubbers) on their website? It's been missing for a very long time, making it hard for referees/administrators to check of products are legitimate. 2. in this process certain priorities (likely linked to budget rather than to a legal issue) were set, and the imaging of balls was no longer on that priority list. But I can, and will, report once again inside ITTF that, obviously, reinstating the ball images would help. I personally can see well the argument that this facilitates the check of legality of a product. Not only the balls, comeback of rubbers' names/symbols images would be much appreciated as well, for the same reason of telling the difference between genuine and fake products. Fake rubbers are probably much more likely to happen. Update for pictures of both ball stamps and racket coverings: They will return, because everyone amongst ITTF staff in charge agrees that it is useful. The main reason why the pictures disappeared was, like I assumed, transition issues from the old to the new ITTF website. The accordingly redesigned picture database is currently still worked on, and the plan is to bring it online roughly by end of January 2019. Thank you so much for following that up Torsten! I know a few people (including myself) have Emailed the ITTF a while back, and never even got a response. The long-awaited bicolor plastic balls have arrived on the market! I have some of those balls from another brand, they're called PSC40+, they look so similar (and are also ABS balls), that I bet they're made in the same factory. They're actually quite good balls, they feel harder & heavier compare the D40+ 3* balls.